Do you have the Courage to Be You? Posted in books, C2BU, Courage Worldwide | Comments Off on Do you have the Courage to Be You? I’m over at The Mom Initiative today talking about ways to stop sibling squabbles! Posted in parenting, sibling rivalry, The Mom Initiative, tips | Comments Off on I’m over at The Mom Initiative today talking about ways to stop sibling squabbles! 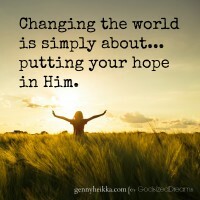 A note to the world-changer: What are you putting your hope in? Posted in God-sized Dreams, pursuing dreams | Comments Off on A note to the world-changer: What are you putting your hope in? Don’t miss new books and giveaway (over $400)! Posted in books, parenting | Comments Off on Don’t miss new books and giveaway (over $400)!